Pretty much the last thing we need during labor, right? Say you are in labor and your care provider (obstetrician or midwife) says they are going to use an intervention. You do not wish for this intervention to be performed, but they push back and tell you that it’s hospital policy, or *only* tell you the risks of not doing the intervention; or worse, they don’t say anything and start making threats. What can you do? First let me say, as a laboring person you should not have to worry about getting non-evidence based care. Planning ahead and choosing a birth setting, care provider and model of care that aligns with your birth wishes can go a long way in preventing this situation from transpiring, but unfortunately it can *still* happen even with all the advance planning in the world. Ask for the provider to walk you through the informed consent process. Your provider has a legal and ethical obligation to provide you with this process for any/all interventions. They must discuss with you the benefits, risks and alternatives to the intervention. This must include the benefits/risks of the alternatives, as well. They must also disclose what would happen if you did nothing. They must answer any question you may have. Ask for some time to discuss the matter with your support person/people. This may include your partner, your doula, or any other person whom you have invited into your birth space. The person you talk with doesn’t have to be knowledgeable at all, really. The goal is just to see if you can buy yourself some time. If you are dealing with an emergency situation, you won’t have time to talk. If they give you time to talk, you know it’s not a real emergency. Give your consent or refusal. If you give your consent and change your mind later, you can tell them you’ve changed your mind. it’s okay, it’s not a contract. You can revoke your consent. If your provider makes threats or is combative and difficult to speak with despite your best efforts, you can ask for a new provider. You have the right to switch care providers (yes, even while you are in labor.) You can ask for another OB or midwife in the hospital to attend your birth. If you are in a birth setting where they do not have another provider available, you can ask for the patient advocate or chaplain. These individuals can serve as a mediator of sorts, to help facilitate communication between you and the care provider. This may seem extreme, but the alternative is checking out of the hospital against medical advice (AMA) and heading to a different hospital. It’s probably the last thing you want to do when you’re in labor, but it has been done. This, of course, begs the question . . . What kind of threats could they make? I’ve heard of providers threatening to call CPS on families who refuse to cooperate with their plan. This is mostly an empty threat because a.) CPS understands that you have the right to informed consent and refusal and b.) even though CPS is obligated to respond to the call, it doesn’t mean that anything will come of it. Don’t buy the line about “it’s hospital policy”. Yea, it’s the care providers obligation to abide by hospital policy, but it’s not yours. Hospital policies are not laws, therefore you are under no obligation to follow them. Start off on the right foot! Right when you get to triage and then again in L & D, introduce yourself, or have your partner/doula introduce themselves to the staff. Read their name tag, say their name when you introduce yourself, shake their hand. Thank them for supporting you/your partner. Ask them about their life outside of work, their job, their kids, anything . . . make small talk and tell them things about you outside of your exciting journey to becoming parents. Bring a little treat for the nurses station. You don’t have to go over the top, it can be candies or cookies or whatever. Gifts of food are a way to show them that you are thoughtful and kind. It’s a way to humanize them and yourself. Write your names on the gifts so they remember you/who they are from. You are building a little relationship with the people who are supporting you and you want them to consider your feelings/wishes/preferences if push comes to shove. This is more likely to happen if you’ve already made an impression that you are kind and thoughtful. 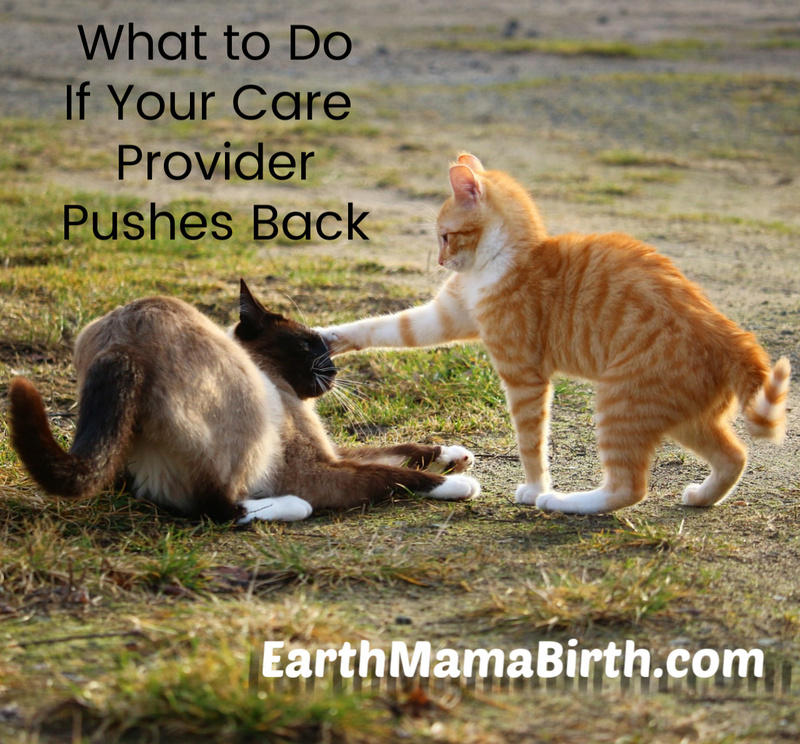 Do you have any other tips for handling a situation where your care provider disagrees with your choices during labor? Please leave a comment. Thanks!